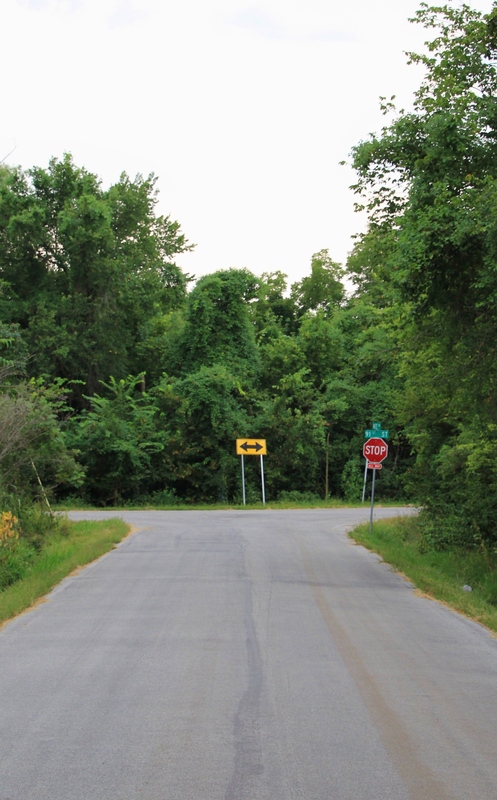 Have you ever found yourself at the intersection of Known and Unknown, often referred to as Crossroads. It can be like peering out at a wide vista of unfamiliar landscape. You know where you came from and where you are now, but not where you may be headed…at least not yet. This journey will be a process, and you will probably feel alone. Change appears on the horizon. So does uncertainty. Remember the movie, Castaway, with Tom Hanks? If you don’t recall it in detail or have not seen it, please allow me to briefly describe it (bear with me if I mis-state a detail as it has been quite a while since I have seen the movie).Tom worked for FedEX and was returning from a trip from an eastern European country where he was setting up a local FedEX facility. On his return back to the states the jet crashed in the ocean during a severe thunderstorm. The only survivor was Tom, along with some packages which washed up on the beach of a small remote island miles away from the crash site. After four years (+ or -) on this island he finally escaped the treacherous reef in a self-built raft. He took with him his beloved Wilson, a soccer ball which he painted a face on it with his blood from an injury, and a package that somehow gave him ties to his mission and previous life. After many days he was rescued by a freighter and eventually returned to the FedEX facility from wince he started the journey. He sought out his fiancé, only to have found her married with children. The end of the movie follows Tom to an artist’s home in the middle of Montana or Wyoming…close to nothing. He was compelled to deliver the one package he took with him, four years after taking it from the European facility. The gracious artist accepted the package with a sense of puzzlement (of course she would be perplexed). The last scene shows a somewhat haunting image of a man without a home, sitting in his car at the intersection of two gravel roads. His Crossroads. The castaway was a changed man. After four years alone, struggling to survive, trying to remain sane, anyone would be changed. He even contemplated suicide. It took a great deal of courage to finally attempt his escape over the coral reef, as he tried before and the surf flung him into the coral and ripped open one of his legs. Escape seemed hopeless after his initial attempt years ago. However, staying on the island another day seemed just as hopeless so he made the decision to try again. He succeeded, only to discover that he no longer fit in where he was before. I always wondered where he eventually ended up, and if he ever came to grips with his new life. Did he go left, right or straight at this life intersection? Did it matter which way he went? There are many types of Crossroads; relationships, employment and career choices, health issues, births and deaths, accidents, dysfunctional family issues, threats and lawsuits, marriages and divorces, relocating to another area, ending a friendship, deciding to enlist in the military, choosing a college, etc.. I am at a Crossroads which is one encountered by many, and is not at all unfamiliar to me. However, it is different from times past. I need a career change, and I just turned sixty. Ouch, I actually said it out loud…sixty! Some say it is just a number while others say it is the downhill side of living. Many speak of retirement (I cannot relate). Since I believe each of us has a specific quantity of days to live, I don’t fret over my age. I do question my future, though. As the castaway changed as the result of his ordeal, I, too, have changed due to time and experiences. So, I have a choice to make, just as Tom Hanks did at the end of the movie. Which road do I choose? I have been in the commercial construction industry for almost twenty-five years. Do I continue working in the same industry which has been good to me in many ways, but has also sucked the life out of me? Or, do I begin anew with a different career, perhaps totally unrelated? This is my quest, and why I stand at this particular Crossroads at this particular time in my life. As with the returned castaway, I don’t know where I fit in nor where my search will take me. However, I am cautiously optimistic, and even a bit excited about finding out. I hope the adage, The joy is in the journey, will be true for me should I choose to leave the familiarity of the construction industry. My gut tells me I won’t return. Whether I have another thirty, twenty or ten years left to live, I still have much I want to do and see and participate in. The bottom line is this: I simply want to finish well. Well, I remembered to post no. 2…actually, I wrote myself a note to do so just in case I forgot to keep my promise. The very act of writing myself a note solidified my remembering. Whatever works, right? Today is a typical Spring day in our area with mild temperatures and rain on and off. All manner of flowers are shooting up from the dirt and trees are starting to bud out. The grass is turning greener and growing taller. These dynamics reminded me of a photograph of our dog, Carson, that I took last year- a little later in the season. 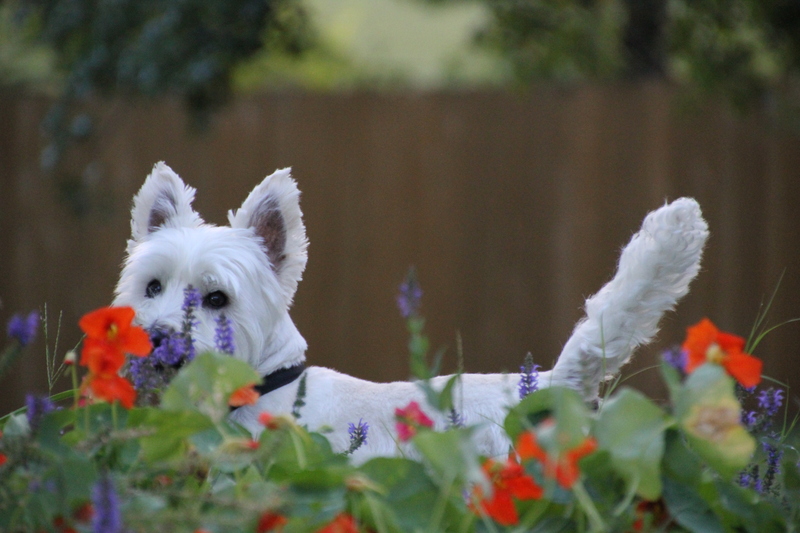 The flowers are nasturtiums, and Carson is a Westie.